Hey guys it is me. Hi Royce, glad you were able to come to our gig on Sunday in Juda at the Last Chance Saloon. We enjoyed meeting you! super talented, super hardworking group of musicians!! Keep rockin' gals. Thank-you Beth for all you have done for us PRECOCIOUS girls. 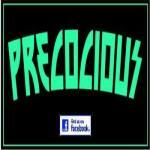 Precocious is off to a fantastic start, with a talent and sound well beyond their years. It will be exciting to see what the future holds in store for them!